Recently I examined an ECF quote posted by Matthew Bellisario: Cyril's Proof for God's Special Revelation Outside of Scripture. Matthew posted quotes after I presented this question to him: If Cyril believed in another infallible "voice of God", I'd be willing to see the proof. That is, demonstrate that Cyril likewise told his readers to look to "x" to see the rest of God's infallible deposit given to humankind. Matthew's first Cyril quote didn't work out very well. I can appreciate his concession to this fact when he responded, "OK James, I can go along with that interpretation on 17. What about the following post on lecture 18? I did not see such a spirited response on that one." Lecture 18 also contains some interesting text which puts the Church herself as the head which delivers "all the doctrines which ought to come to men's knowledge." Cyril here does not say the Scriptures alone either. What do you think of this text? "Now then let me finish what still remains to be said for the Article, "In one Holy Catholic Church," on which, though one might say many things, we will speak but briefly. 23. It is called Catholic then because it extends over all the world, from one end of the earth to the other; and because it teaches universally and completely one and all the doctrines which ought to come to men's knowledge, concerning things both visible and invisible, heavenly and earthly ; and because it brings into subjection to godliness the whole race of mankind, governors and governed, learned and unlearned; and because it universally treats and heals the whole class of sins, which are committed by soul or body, and possesses in itself every form of virtue which is named, both in deeds and words, and in every kind of spiritual gifts. The use of the quote above by Matthew is an excellent example of how many outside of the faith misunderstand sola scriptura. Sola scriptura never argues the church isn't important, or that it does not have authority to teach God's truth. Perhaps Mr. Bellisario thinks in terms of dichotomy: a Protestant has either the church or the Bible, but never both at the same time. This is far from true. I admit, there are those who may have in fact overreacted to the errors of Rome and devalue the church. I am not one of those people. I belong to a confessional Reformed church that takes the Scriptural mandate of "church" very seriously. As to Cyril, I don't see anything in his statement that contradicts sola scriptura. Nothing in Cyril's statement implies an infallible deposit of truth standing beside the Scriptures, which is what I asked Matthew to provide. This is ridiculous. I've seen so many attempts by Roman Catholics to deal with history. I've seen some separate the authorial intent (be it pope or council fathers) from the teaching itself; I've seen some relativize the conscious faith of previous generations, saying we are not bound to them; I've seen some readily utilize the word of Liberal scholars to basically say, "If you rely on evidence and scholorship, then the Liberals' conclusoins are right! The only way to be orthodox is to submit to Rome, who decided orthodoxy by majority!" And now I'm seeing a young man misread quotations in a very bad way, to put it mildly. The first one was the a quote about the Ark of the Covenant supposedly referring to Mary, but the quote clearly was referring to Jesus. Now there are these quotes from Cyril. These kinds of errors are sad demonstrations of how Rome makes one "find" her teachings in history. Just sad. While Kepha attacks the “young man”, he does not provide any help on the issue being discussed. Instead, he decides to ridicule “Rome” and her defenders. In any case, the first rule of engagement is to define who the opponent is. I hope that Kepha has finally decided who he wants to be so we can address him and his views appropriately. The question of which camp Kepha belongs is not one that only Catholics should ask; Protestants should also be asking the same question. On another blog site (now defunct), he once expressed discomfort that someone had contacted his parish priest concerning his vulgar comments against the Church. This behavior seems to be continuing or perhaps, Kepha is out of the closet. His references to “Rome” would lead one to believe that he has placed himself outside of “Rome”, but then, he has always been torn apart – one foot in Catholicism and another in the anti-Catholic camp. Kepha attacked the positions of the young man, not the young man himself. You, on the other hand, simply attacked Kepha. Hopefully you see the difference. "Kepha attacked the positions of the young man, not the young man himself. You, on the other hand, simply attacked Kepha. Hopefully you see the difference." It is not hard to see that "young man" as used was intended to be derogatory. Likewise, "Rome" is not the best way to refer to the Catholic Church. Synods and Councils determine controversies of FAITH and cases of conscience. Synods and Councils have erred and may err. Therefore...not a rule of FAITH and practice. Just so you know, Rome is not the Catholic church. She claims that title, but she does so wrongly. I beg to differ. I don't see anything contra Catholic in any of Cyril's writings. The problem that you have here is that the great Saint says that all doctrine comes from the Church. I never said that the Scriptures and the Church are opposed to each other either. The great Saint said "all" doctrine comes through the Church. That includes Scripture, which cannot be separated from her, as you are doing when you claim that Scripture is the sole rule of faith. Scripture is not the sole rule of faith for Saint Cyril, it is the Church that gives him his sole rule of faith. He says so, say what you will. Lets let the text speak for itself instead of acting as if he did not mean what he wrote. "It is called Catholic then because it extends over all the world, from one end of the earth to the other; and because it teaches universally and completely one and all the doctrines which ought to come to men's knowledge......" The object here being referenced is the Church. Who is doing the teaching? Scripture alone? No, the Church is the point being referenced in this sentence as being the teacher. All doctrine means, all doctrine, not some of it. This is plain language, telling us that the Church, not Scripture alone is the sole authority. The Catholic teaching of Scripture in Tradition is quite apparent here in his writing. He references Scripture as being an authoritative source within the Church in his writings, not any sole rule of faith whatsoever. On another blog site (now defunct), he once expressed discomfort that someone had contacted his parish priest concerning his vulgar comments against the Church. My comment on the now-defunct Reformed Catholicism blog was directed at the person who contacted my parish priest. This person (no, I won't give you his name even though you are clearly a nosy person who speculates when not having the information) was a good friend of mine who attended the same parish. I've known this person for going on a decade. He has all of my contact information, and yet never once asked me about why I was thinking of leaving Rome after having converted to it from Protestantism. He never asked me for my reasoning, or whether or not I wanted to discuss things. He saw my comments and contacted our priest. Is this enough information for you, nosy dozie? I hope so because I'm not giving you anymore. This is what happens when can read without zealousness becoming ignorance, i.e., they can read accurately. I don't see anything contra Catholic in any of Cyril's writings. I never said there was anything "contra Catholic." I've implied Cyril is against you. The problem that you have here is that the great Saint says that all doctrine comes from the Church. Cyril says the Church "teaches universally and completely one and all the doctrines which ought to come to men's knowledge"- he doesn't say Rome is a deposit of truth. I never said that the Scriptures and the Church are opposed to each other either. I don't believe this either, though many Catholics think Protestants don't believe the church has authority. I believe the church has authority. The great Saint said "all" doctrine comes through the Church. That includes Scripture, which cannot be separated from her, as you are doing when you claim that Scripture is the sole rule of faith. I hold Scripture is the sole infallible rule of faith, not the sole rule of faith. I believe the church has authority, just not infallible authority, and is a rule of faith, but not an infallible rule of faith. Scripture is not the sole rule of faith for Saint Cyril, it is the Church that gives him his sole rule of faith. I believe Cyril's writings show a man who believed Scripture was the infallible "voice of God". You have yet to prove from Cyril's writings that the church is an infallible rule of faith standing beside Scripture. He says so, say what you will. Lets let the text speak for itself instead of acting as if he did not mean what he wrote. I've asked you to demonstrate Cyril believed in another infallible "voice of God". That is, demonstrate that Cyril likewise told his readers to look to "x" to see the rest of God's infallible deposit given to humankind. So far, you haven't provided anything compelling. "It is called Catholic then because it extends over all the world, from one end of the earth to the other; and because it teaches universally and completely one and all the doctrines which ought to come to men's knowledge......" The object here being referenced is the Church. Who is doing the teaching? Scripture alone? No, the Church is the point being referenced in this sentence as being the teacher. Matthew, sola scriptura does not hold that the church does not teach what the "scriptura" says. An advocate of sola scriptura holds the universal church "extends over all the world, from one end of the earth to the other; and because it teaches universally and completely one and all the doctrines which ought to come to men's knowledge." We can affirm this statement without holding the church is likewise an infallible rule of faith. There's nothing in Cyril's quote that implies the Church is also an infallible rule of faith. All doctrine means, all doctrine, not some of it. This is plain language, telling us that the Church, not Scripture alone is the sole authority. Once again, the point is sole infallible authority. I believe the church has authority, not infallible authority. You can search this blog, and find this point made many times. The Catholic teaching of Scripture in Tradition is quite apparent here in his writing. He references Scripture as being an authoritative source within the Church in his writings, not any sole rule of faith whatsoever. Same error as my last comment. I know of know clear Biblical evidence a synod or council since the time of the apostles is infallible, or that the members comprising such are inspired. Saying it is, as some do, does not make it so. If someone could demonstrate the Bible perspicuously teaches the necessity of an infallible church, synod, or council, I'm listening. Athanasius stood against the majority church at certain points, including some councils if I recall. He acted by a conviction that his theological points conformed to the word of God, and we're glad he did. Think also of the Old Testament church. It existed with a leadership that was not infallible, yet no one asked how it could be taken "seriously." On a very practical level, the Catholic Church says very little infallibly, yet, Catholics take it seriously. I recall Tim Staples making this very point in debate with Dr. White- that Catholics are responsible to all the Church says that's not been deemed "infallible." I would venture to say, the church produces more fallible material than ex cathedra material. On Catholic Answers currently, there's a discussion "Did any Pope proclaim any ex cathedra dogmas prior to the Schism with the East? "(http://forums.catholic.com/showthread.php?t=362049)- it appears very little can be substantiated- yet which Catholic will argue that the Pope's during this period should not have been taken seriously? Pope's continually release encyclicals and writings. Are we to say that Catholics shouldn't take them seriously unless they are infallible? Kepha is out of the closet. I don't recall writing a post on Kepha, so I'd ask that he not be scrutinized. I don't want to have to start deleting comments again. James wrote, "Matthew, sola scriptura does not hold that the church does not teach what the "scriptura" says. An advocate of sola scriptura holds the universal church "extends over all the world, from one end of the earth to the other; and because it teaches universally and completely one and all the doctrines which ought to come to men's knowledge." We can affirm this statement without holding the church is likewise an infallible rule of faith. There's nothing in Cyril's quote that implies the Church is also an infallible rule of faith." James you are contradicting yourself. If the Church teaches all doctrine then it teaches it infallibly. It cannot be any other way, otherwise it is not real "doctrine". You are digging a hole for yourself here. Then you wrote, "Cyril says the Church "teaches universally and completely one and all the doctrines which ought to come to men's knowledge"- he doesn't say Rome is a deposit of truth." I never said anything about Rome anywhere here have I? No I have pointed out that it is the Church that teaches all doctrine, not Scripture alone. St Cyril teaches the opposite of Sola Scriptura. That is the point. He never defines whether the Church has its head in Rome or not. That has never been the discussion in this conversation. The fact is St Cyril did not believe what you believe. His beliefs in these passages are in line with the teaching of the Catholic Church, not your "church". Why anyone would take seriously criticism from Dozie on the topic of personal attacks is beyond me. "Why anyone would take seriously criticism from Dozie on the topic of personal attacks is beyond me." One reason is that I stand firm for everything I have written on any blog site, including the link you provided. I affirm what I said there. I am not sure however if you understood what I was saying. I stand firm on what I said about Kepha or Luther, whatever his name should be. Your refusal to recant your comments is hardly a plus. I guess it shows a form of consistency, but while a broken clock may be consistent, we doubt its accuracy. If the Church teaches all doctrine then it teaches it infallibly. It cannot be any other way, otherwise it is not real "doctrine". Okay, boys and girls, let's play a game: What is the logical problem with this assertion? All real doctrine is infallible. The Church teaches all doctrine. Ergo, the Church is infallible. Because the Church teaches all doctrine, it does not therefore follow that the Church, however defined, is infallible. Matthew B teaches all doctrine. James Swan teaches all doctrine. Infallibility would attach not to the teacher; rather it would attach to the source material. It is entirely possible for a fallible instrument (the Church) to teach fallibly from an infallible source (Scripture). For MB's argument to be true, he needs to establish that the Church is, therefore, the font of infallible doctrine. Good call, Gene. When Mr. Bellisario states: "If the Church teaches all doctrine then it teaches it infallibly," he simply betrays his lack of familiarity with the operations of his own church. Gene, that is bad logic. God does not teach any doctrine fallibly, period. It is clear that the Saint that is being quoted here believes that the Church teaches all doctrine to all of mankind, not Scripture Alone. You are really off of your rocker if you think there can be an infallible deposit of faith without an infallible depositor. Did the apostles teach Christ's doctrine infallibly? If so how did they do it without the New Testament canon that you think stands all by itself as an infallible source of doctrine? The fact is the apostles did teach doctrine infallibly, without the Scripture that you claim is your sole authority. As far as a lack of familiarity, you have no room to talk Turretin. The errors on your blog pertaining to Catholicism are numerous, and there is not enough time in the day to address them all. Let us not forget you and your buddy Bridges making absurd conclusions on your fictitious ideas of Catholicism and contraception. You have no idea how many people have read that series and realized how bad you two are at getting the facts straight. the fact here is the great Saint did not believe what you believe. He in fact believed that the Church teaches 'all' doctrine, period. Not Scripture alone. I refer you to Gene's comments. never said anything about Rome anywhere here have I? I've been trying to stay focused on your answers to my initial questions. You stated earlier, "The great Saint said "all" doctrine comes through the Church. That includes Scripture, which cannot be separated from her, as you are doing when you claim that Scripture is the sole rule of faith. Scripture is not the sole rule of faith for Saint Cyril, it is the Church that gives him his sole rule of faith. Perhaps you understand "Rome" differently than I. As far as I know, the Roman Catholic Church claims to have the gift of infallibility. In response to my question to produce another infallible rule of faith in Cyril's writings, you say "the Church that gives him his sole rule of faith" while in the previous sentence you say, "Scripture is not the sole rule of faith for Saint Cyril" I admit, I don't have my Catholic Champion decoder ring with me tonight, so perhaps you make sense in your world, but not in mine. No I have pointed out that it is the Church that teaches all doctrine, not Scripture alone. You can point that out all you want, but I agree the church teaches "all doctrine." The church teaches the doctrines found in Scripture. She hold's up the truth. She brings it forth to the world and proclaims it. She is not though the infallible source of that truth. So, is "the church" the answers to my original questions? If so, you haven't proved Cyril believed in an infallible church functioning as another infallible authority. St Cyril teaches the opposite of Sola Scriptura. That is the point. I doubt at this point if you even understand sola scriptura, and I've yet to see any substantial proof from Cyril to justify your assertions. He never defines whether the Church has its head in Rome or not. That has never been the discussion in this conversation. Matthew, here's a reminder: If Cyril believed in another infallible "voice of God", I'd be willing to see the proof. That is, demonstrate that Cyril likewise told his readers to look to "x" to see the rest of God's infallible deposit given to humankind. If you don't want to use "Rome" (which I think is fairly ironic that you seem to indicate Cyril knew nothing about Rome's special infallible Pope), use, "infallible church." Prove Cyril believed in an infallible church (wherever he located it) as the "x" to my question. The fact is St Cyril did not believe what you believe. That's true. After reading through a chunk of Cyril recently, I admit I didn't go through an exorcism before I entered my church. Did you? It seemed quite a standard practice for Cyril. Go ahead and read it in Cyril's writings for yourself. But, I do respect Cyril for pointing his readers (or hearers) to the Scripture as the source of infallible truth. I can respect that, even if I disagree with some of his conclusions. His beliefs in these passages are in line with the teaching of the Catholic Church, not your "church". You can say it, but you haven't proved it. If you have, I've missed your overwhelming proof. Gene, that is bad logic. Matthew, name the logical fallacy. God does not teach any doctrine fallibly, period. God teaching infallibly and the Church teaching as an instrument of God are not convertible. Notice the hidden assumption: God teaches through the Church, ergo the Church is infallible. That's a nonsequitur and lacks a supporting argument. Why? Because that would mean "the Church" is inspired. Where is the supporting argument? You are really off of your rocker if you think there can be an infallible deposit of faith without an infallible depositor. You're off your rocker if you think the Church and the Apostles are convertible. Did the apostles teach Christ's doctrine infallibly? "The Apostles" and "the Church" are not convertible. If so how did they do it without the New Testament canon that you think stands all by itself as an infallible source of doctrine? Sola Scriptura does not apply to the period of nscripturation, and Sola Scriptura is Tota Scriptura, so it doesn't apply to the NT alone. We've been over both of those ideas multiple times with you, yet you can't seem to hold that idea in your head. Gene, that is bad logic. God does not teach any doctrine fallibly, period. It is clear that the Saint that is being quoted here believes that the Church teaches all doctrine to all of mankind, not Scripture Alone. Matthew, I suggest applying your standard to the Old Testament. Was there an infallible leadership in the Temple? And Matthew, this is where you zeal gets the better of you, as is often the case. There's no need to say stuff like this. I don't think you're crazy. I do think you're blinded by your zeal, and I hope that eventually someone can get through to you. We've refuted you over and over and over again, but yet you ignore it and continue on. if you think there can be an infallible deposit of faith without an infallible depositor. Ah, OK, this is "the Church created the Bible argument." it goes: the church has to be infallible in order to give us an infallible book. The book didn't exist before the church. But the Scriptures existed before the church (recall that thing called the Old Testament). The Scriptures existed before an infallible migisterium came on the scene. The New Testament church was never without Scripture. The Church taught out of the Old Testament. The fundamental truths of the gospel are in the Old Testament. Even Augustine in his controversy with the Donatists stated they needed to prove their church out of the Scriptures. The preached out of the Old Testament. They always had Scripture. It is clear that the Saint that is being quoted here believes that the Church teaches all doctrine to all of mankind, not Scripture Alone. To say that Cyril believed that the Church teaches all doctrine is not the same as saying that Cyril believed that the Church did so infallibly as the font of doctrine. Those are not convertible, Matthew. Where does Cyril state that the Church teaches doctrine and is therefore infallible? That's what you need to show...but you haven't. Rather, you are smuggling your assumptions into Cyril's statements. To arrive at your position, you have to do that...but Protestants of the Reformed stripe, whether Presbyterian or Baptist both agree that the Church teaches all doctrine...but not infallibly so. That's the lacking step...the one you have to add to Cyril's words to arrive at your conclusion. To spell it out...you're reading "Cyril teaches x" and concluding, without benefit of demonstration as well as argument that he believed the Church is an infallible instrument of teaching. God teaches through the Church. The Church does so infallibly. a. Nowhere does Scripture teach that the Church is given the gift of infallibility. b. The Apostles and "the Church" are not convertible. c. In the OT, the teachers in the temple did not teach infallibly. The prophets and biblical writers, when they spoke and wrote did so, but that's not the same thing as the teaching function of the Church qua Church. Instead of saying I'm out of my mind, Matthew, you should be thanking me for outlining the things you need to show in order to arrive at your conclusion. 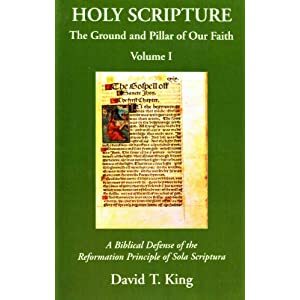 Gene wrote, "Sola Scriptura does not apply to the period of nscripturation, and Sola Scriptura is Tota Scriptura, so it doesn't apply to the NT alone." Where does Our Lord tell us that after a certain period we would go by Sola Scriptura? Did the apostles teach us that? No. This is more nonsense, with no proof to back up your claims. Gene wrote,"Those are not convertible, Matthew. Where does Cyril state that the Church teaches doctrine and is therefore infallible?" So you are saying that St Cyril is telling everyone to follow fallible doctrine? How on earth you guys can come up with all of these theories with a straight face is beyond me. James wrote, After reading through a chunk of Cyril recently, I admit I didn't go through an exorcism before I entered my church. Did you? It seemed quite a standard practice for Cyril. Go ahead and read it in Cyril's writings for yourself. Of course I did. If you knew anything about the sacraments of the Catholic Church you would not have asked that question. Once again you have no idea about the context of the exorcism. This is a pointless conversation. You want everyone to assume that everything changed after the New Testament was completed as if God dropped it out of the sky with a note attached to it saying "follow this alone now." This has never been proven by anyone. In fact once again who's mold does the great Saint fit into? Yours or the Church's? The readers can decide for themselves who's argument makes more logical sense. Sint Cyril tells us that the Church teaches all doctrine. You keep avoiding that clear point made by Cyril, adding your own definitions of Scripture Alone to it. Did the Saint say anywhere that the Church was following Scripture alone? No he did not. You are making all of the qualifiers form your own additions the Saint's writing. Here is the quote,""extends over all the world, from one end of the earth to the other; and because it teaches universally and completely one and all the doctrines which ought to come to men's knowledge." It says nothing of Scripture, period. Quit adding to his writings. Notice that what I stated was that Sola Scriptura is applicable to the normative state of the Church, which doesn't include the period of enscripturation. Now you're disputing the basis of that statement...but that's not why I told that to you. If you're going to dispute our rule of faith, then it is incumbent upon you to accurately represent it. If you'd like to dispute that caveat, this isn't the place for it. I only brought it up because you invoked the period of inscripturation, which Sola Scriptura does not apply to. So you are saying that St Cyril is telling everyone to follow fallible doctrine? That could only follow if the unargued and unsubstantiated assumption is that a doctrine, to be true, must be infallible and that the teaching instrument conveys infallibility to it. Both are nonsequiturs. Tell us is divine simplicity fallible or infallible? Tell us, is Nicene Subordinationism fallible or infallible? There are versions of Trinitarianism that deny Nicene Subordinationism but that Catholicism considers Orthodox. Yet Catholicism teaches Nicene Subordinationism. How on earth you guys can come up with all of these theories with a straight face is beyond me. You are still assuming, without benefit of argument, that for a doctrine to be true it must be taught via an infallible instrument, and this instrument is the Church. Where is the supporting argument? Where does Cyril say that the Church is infallible? Of course I did. If you knew anything about the sacraments of the Catholic Church you would not have asked that question. Contrary to your latest blog article, I have never claimed to be an expert on Romanism. Search my blog if you will, you'll never find this. Also note, and you'll have to take my word for this, I have more Catholic websites saved in my favorites folder than Protestant. I tend to buy Catholic books as well- to the suspicion of many in my church. In regards to Cyril's use of baptismal exorcism, my question would be if his description of it and it's procedure match what you went through. You may also wish to consult the introductory material in NPNF vii (second series), around page xix-xxi. Too bad we're not talking about Chrysostom, because then I would ask you how it was to be naked during your exorcism. Once again you have no idea about the context of the exorcism. Actually I have the pages I just suggested to you from NPNF. If your exorcism differed from that described on those pages, is it really true that you and Cyril believed the same things, or does "development" have to be brought in to smooth it all over? This is a pointless conversation. You are not required to continue. You want everyone to assume that everything changed after the New Testament was completed as if God dropped it out of the sky with a note attached to it saying "follow this alone now." This has never been proven by anyone. OK, demonstrate where I've done this. In fact once again who's mold does the great Saint fit into? Yours or the Church's? The readers can decide for themselves who's argument makes more logical sense. "Even to me, who tell thee these things, give not absolute credence, unless thou receive the proof of the things which I announce from the Divine Scriptures. For this salvation which we believe depends not on ingenious reasoning, but on demonstration of the Holy Scriptures.- Cyril of Jerusalem, Catechetical Lecture IV, Section 17"
Sint Cyril tells us that the Church teaches all doctrine. You keep avoiding that clear point made by Cyril, adding your own definitions of Scripture Alone to it. The church does do exactly as described by Cyril, at least mine does- we have a rich systematic theology, in-depth Bible classes, as well as exegetical sermons. If your interested, I can link you to some of the sermons. My church strives to be faithful to the entirety of Scripture as she teaches, preaches, and exhorts. For those churches, like yours, that add non-biblical doctrines, I would seriously heed the exhortation of Cyril, and find yourself a good Bible based church. Not knowing what area you live in, I'm sure those of my friends who post on this blog would be more than happy to help you find a good church. Simply say the word, and we'll gladly do this for you. I mean that very seriously. Did the Saint say anywhere that the Church was following Scripture alone? No he did not. Again Cyril believed the church had authority, but I've yet to see proof from you he believed she had infallible authority, or preceded the Scriptures. You are making all of the qualifiers form your own additions the Saint's writing. What qualifiers and additions? I've asked you for proof for particular assertions you've made. So far, you've come up empty. Here is the quote,""extends over all the world, from one end of the earth to the other; and because it teaches universally and completely one and all the doctrines which ought to come to men's knowledge." Matthew, the church does extend " over all the world, from one end of the earth to the other." Unless Cyril's point is different in the original language he wrote this in, there's no argument or qualifier from me. The church does teach "universally and completely." God has made sure of this. Each post-apostolic generation has God's writings. The church is to go into all the world and preach the Gospel. Because the church has a Bible she can teach "one and all the doctrines which ought to come to men's knowledge." It says nothing of Scripture, period. Quit adding to his writings. I'm going with Cyril here. Your blog posts and comments are not to be believed or trusted unless you can prove them from the Divine Scriptures. You haven't proved Cyril held to any other infallible authority. I wrote this to point out, I'm not an expert, but I do my best to be a learner. Sure I have books that are written against Roman Catholicism, but I have more that are in favor of Roman Catholcism. I can't be accused of not seeking to find out what the other side is saying. So Matthew, if you'd like to continue presenting a false picture of me that I claim to be an expert on Romanism, you will greatly diminsh the view I have of you. The prayers of exorcism prior to Baptism is one of the most basic elements of the rite that most informed people would have known about, and I believe that this is Matt's point. A cursory reading of Catholic theology would have informed you of this, so it does call into question your openess to knowledge of the Catholic faith. This certainly isn’t an arcane point that requires a professional theologian to have known. I’m not sure if you have taken any theology courses before, but I would be shocked if Protestant schools when discussing Baptism in its historical setting would not cover this. On the other hand, it would be ridiculous if anyone demanded that you know every point of Catholic theology, but this is one of those basic things that you should know. I might have been a tad harsh in my last post. I just found it condesendingly dismissive of you to have replied that you are not an ‘expert’ on Catholicism when you clearly did not have to be to have known that excorcism has historically been a part of the Rite of Baptism. I could be wrong. I actually responded more than this, and I'm not sure why you wouldn't note that. I was not condescendingly dismissive, anyone taking the time to read my comments will see that. I was reading NPNF's overview of Cyril and the early church. Is his practice of exorcism the same as it is for the Roman church today? That's my question. If it is, then I stand corrected. So are you saying now that you did know that exorcism is part of the Rite??? No, I was not aware there was baptismal exorcism. On the other hand, after reading thorough the intor in NPNF vii, it appears it's changed a bit since the old days. I just visited your blog this morning Matthew, and I notice you've avoided my questions and chosen the way of propaganda. I had expected better from you. What I find most appalling your insistence that I "denied". Rather why don't you add to your posts that I asked you questions of clarification (which you did not answer), and I then went on to tell your buddy "No, I was not aware there was baptismal exorcism. On the other hand, after reading thorough the intro in NPNF vii, it appears it's changed a bit since the old days? But, I guess the type of propaganda you're putting forth gets you off the hook of answering simple questions and dealing with specific contexts in this blog post. I've been trying to be fair with you Matthew, but you've chosen the path of propaganda and insult. I'll try one last time: Is the rite of exorcism you went through exactly the same as that of Cyril, or Chrysostom, or the early church in general? If not, how can you claim any of the early church fathers on something like this? So what James. The fact is you had no clue as to the exorcism Rite that St Cyril was speaking of. The fact is the Catholic Church does have an exorcism upon entering the Church, which you questioned me on. Now you are trying to cover for your ignorance and are now trying to spin it as if there are changes made to it since the time of Saint Cyril. Who cares? Do want the exact Rite of exorcism in print from Saint Cyril's time to match the text of the exorcism now? Is that what you want? If the text of Saint Cyril's exorcism Rite is not exactly the same text as now in the Catholic Church does that prove it is not an exorcism of the persons entering the Church? What are you trying to gain from this little side expedition of yours? Admit that you were wrong, and don't try and qualify it with some other argument that did not pertain to the original one. I expect a bit more from you.